There has never been a moment in the history of the U.S. Catholic Church when the trust and confidence in bishops as leaders has been more in doubt. The allegations of sexual abuse and misconduct levied against Archbishop Theodore McCarrick—and how they were or were not handled by church leaders—would have been enough to sink our episcopal poll numbers. The Pennsylvania grand jury report guaranteed a loss of trust and gave birth to a new level of skepticism. Trust will not be easily reclaimed. I do not think I am being too alarmist in suggesting that it may well be lost for all but the younger members of our episcopal conference. But there is a critical decision coming, which will define the depth of the morass in which the bishops find themselves at this moment. The United States Conference of the Catholic Bishops must promise the people of our church in this country that in addressing the issues we currently face, we will do so in open session and further promise that nothing will be discussed in closed session. In fact, I would proffer that there should be no “executive session” at our November meeting at all and that the entire meeting and discussion be open. There has never been a moment in the history of the U.S. Catholic Church when the trust in bishops as leaders has been more in doubt. Our general habit when dealing with neuralgic issues is to introduce the topic in public session, strictly control and limit debate and then really hash our solutions out in closed session. That did not always work in the past, and it will not work now. There is something of a history here with which I am familiar. Up until about 1965 and the end of the Second Vatican Council, the meetings of the U.S. bishops were strictly closed affairs held at the Catholic University of America. Even my predecessor four times removed as general secretary, Msgr. Paul Tanner, was not allowed in the room and was required to sit outside the doorway to the meeting room with notes being passed under the door if questions arose and his help was needed. With Vatican II and the presidency of Cardinal John Dearden, conference staff, including the general secretary, were admitted to the meetings for the first time. Another five years passed before the membership could be convinced that most of the meeting should be in open session with the press, observers and a few other categories given admission and access. It was then that “executive sessions” were introduced as a setting where the membership could really say what they meant and felt. God’s people deserve to know not just exactly what is being done but who is doing it. Finally came video coverage of the meetings by EWTN and with it some occasional grandstanding for the cameras. Secrecy at that time became an even more treasured commodity, and I can personally attest that there were many discussions held behind closed doors that would have edified our people and only a few that would have been embarrassing. I fear for what I am proposing because I know a good number of my brothers would prefer to return to closed sessions altogether. It is not likely, but that would be a tragedy. Whatever the history, this moment requires government in the “sunshine.” Business as usual can no longer be the norm, and God’s people deserve to know not just exactly what is being done but who is doing it. It can be a moment of epochal change for the church in this country. 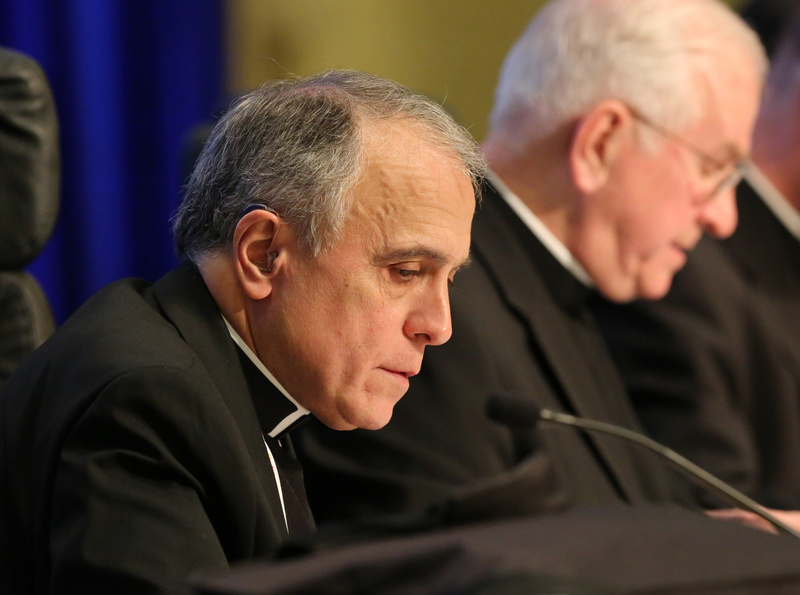 Cardinal Daniel N. DiNardo has outlined an approach that has good merit. The administrative committee of the conference meets in a few weeks to work on the agenda for the November gathering. It would be a good thing if that meeting would also be open to some representation to the outside (something like a “pool” arrangement). There cannot be much left to hide. The custom of more recent times to delete from the official minutes of all major conference meetings, which bishops receive, the names of the bishops speaking on each subject should be discussed and changed. The church does not belong to us, and we cannot continue to think we have the sole responsibility for governance. The proposal of the executive committee announced by Cardinal DiNardo cedes oversight and action to possible new entities. I know there will be debate on that issue, but will it be fully in the open or following past protocols—introduced in public, hammered out in private? It could be that the terrible, painful mess in which the U.S. bishops find themselves at the moment will be an opening to a new, more inclusive, more transparent, more accountable episcopacy continuing the evolution begun with the Second Vatican Council. Such a possibility provides, for me at least, the slightest beam of light in a very dark moment. Why no word from big-money Knights of Columbus or Opus Dei? Embarrased for their fierce loyalty that has been blindsided! As long as the governing structure of the Church is limited to clerics not much will change. The Church says it is the People of God but the reality is it is a closed system run by ordained men. If you are not an ordained man you have no seat at the table. The lay people can agitate all they want for a seat but they will never get because the clerics don’t want any dimunition in their power and control. Sorry. Take it or leave it. Sadly, they are being forced to change. enablers soon to be named. As I commented on a related article, this is an insane mess... brought to us by a century (or more) of secrecy. Come Holy Spirit... enLIGHTen us! And the brilliant light of truth demolishes darkness! Thank you Bishop Lynch for your honesty and sense of authentic vision. I left the church after Cardinal Law mess, and I am at war with my own members to stay now. How about not waiting until the Bishop’s meeting? How about conveninf a council right now and inviting the public to it? I wholeheartedly agree. This cannot wait until November. To fix this, the church should be honest about the fact that mandatory celibacy isn't working .... from pedophiles to half the clergy at any given time being sexual active with adults. ... and that a male-only priesthood isn't working either. Term limits would help as well. But I don't expect leadership to do anything but whine about forgiveness. Bishop Lynch's article provides a link to Cardinal DiNardo's statement that the Executive Committee is developing a plan to be presented to the November bishops meeting. The plan will be developed "relying upon consultation with experts, laity and clergy, as well as the Vatican". All the bishops, not just the Executive Committee, should hold listening sessions in their dioceses where any laity or clergy can express their concerns. Consultation with the laity of the Executive Committee's choosing is too limited. The bishops might look to the Gospel stories for clues about choosing leaders. The only human to anoint Jesus was a woman. Perhaps laywomen should be the ones to choose bishops. You would get an entirely different group of men as bishops if women chose them. I am in my mid-50's. Never has the Church been shown to be as polluted with the homosexual agenda than now. I pray for Christ's Church. Never has the Jesuit order been more indefensible and lawless than with the lies that James Martin spews - a wolf in shephards clothing. Until the order publicly and obviously corrects James Martin, you are vainly supporting this growing mockery of Christ's Church. Most. Rev. Robert N. Lynch is the bishop emeritus of St. Petersburg, Fla.